MacDailyNews Take: Apple Watch, killer. I don’t think I ever saw one in the wild. Won’t be missed. Has M$ ever made any money out of hardware? Even the Xbox was sold at a loss with the aim to make money on software sales. Never mind seeing one in the wild, I don’t remember even reading or hearing about this before today, not even in ads or flyers. Actually the MS Band was quite lauded. Look it up. Microsoft limited its availability for one. Second, it had a flaw in its build where the band would break. This is no doubt one of the reasons why they’ve axed it. But the Band itself is quite innovatice and users love them, save for the build flaw. The 360 was highly profitable on the tail end of the console’s lifetime according to MS. The direction is certainly different at MS now. They aren’t solely focused on Windows, Office and consumer hardware outside of the Xbox one. The new CEO sees them as more as a cloud provider with cross platform tools and services. You can see it in the directions of visual studio and server. 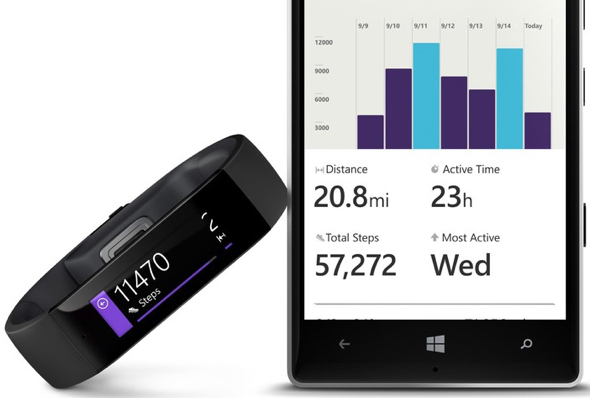 Wonder if MSFT will turn their health services software loose on their own corporate health. It’s been a good month with all of the schadenfreude cruel chuckles aimed squarely at SamSplode & now MS-PHFFT. Crap design, careless PQ & execution and ecosystem yuckiness are their own reward. Can Microjunk be any more the continued epitome of uncool? Good month? It’s been a spectacular decade and a half, all the way back to 2001 with the original iPod was introduced and was the beginning of the end for MS to have any impact whatsoever in the mobile and digital media space. Your life must be pretty sad if this is what gives it meaning. Who thinks in black and white terms like this? These loons are why Mac fans have a bad name. I see the doofus troll is back showing off his lack of intellectual capacity once again. Ok so a persecution complex as well. Sounds about right. Being insulted by a schizophrenic whack job like you is a complement. I’m here once in a blue moon but every time you are here ranting. It’s what you live for, and that, as Michele said, is pretty sad. You’re the rightfully persecuted troll loon here who’s observation skills are that of a a 10 year old. Most of my posts have nothing of the sort. You do understand the concept of having opinions or even enjoying a bit of the ol’ “beleaguered” fun at someone’s else’s expense other than Apples don’t you? You DO understand why Apple supporters might find having fun with that as often happens here? Disingenuous & specious much clueless troll? Try and base your comments on actual informed knowledge for a change. Most of your posts are as idiotic and retarded as that one, the product of a sick and twisted mind. Notably you almost never comment on anything positive, 99.9% of the time you’re fighting evil “trolls” which means anyone who even suggest that Apple is not perfect. No normal person – Apple supporter or otherwise – takes pleasure in the failure of others. That is not rational behavior. Oh, and look up the word ‘disingenuous’. It does not mean what you think it means. You only prove you’re not a regular and in fact a troll – to be summarily dismissed and ignored. I suggest you not only look up the dictionary but every other tome of learning that you sorely lacking in knowledge of. Disingenuous in that you are an attacking troll who perfectly knows what “it’s” doing. How stupid are you anyway? I apologize for piling on here, but dang man. I have been coming here since the bad old days when Apple was maligned by most in the tech community as a peddler of expensive toys. MDN has not appointed you as a policeman for this site, but police it you do. I’m just tired of the relentless bickering and the acerbic, dare I say, hateful replies you make when someone has an opposing viewpoint. Whatever happened to “don’t feed the trolls”? If you attack the trolls then you become a troll yourself, don’t you see that? No wonder people call you out. I read a comment someone posted to you a few weeks ago saying ostensibly the same thing, but you’re still at it. Nobody can have an opinion here if it is not to sing the praises of Apple, you immediately turn it into a mudslinging match. I can’t recommend this site to anyone because of people like you. I don’t want anyone I know to see how ugly Apple devotees can be. Dang man, I never appointed myself the policeman of this site Mr. Sensitive. It’s a time-honored tradition to take pot shots at others who took pot shots at Apple in the beleaguered day. And if you knew this site and MDN’s POV on that you wouldn’t be belaboring the point. The “beleaguered” effect with a dash of schadenfreude. It comes up fairly often. You don’t like it? Too bad. We’ve earned it. If you follow a long “mudslinging match” as you call it you can be sure it’s another troll on the other end and he/it gets treated accordingly. Many have been tossed off this site. Some are just too obnoxious to ignore. I only object to those who do not argue their points of view and come off simply infantile and derogatory just for it’s own sake – insults without any real justifications. I have already made it quite clear my own problems with Apple. I never object to legitimate complaints, never have. If you had any history with this site you’d know that. Another thing, last time I checked this is a free country and I am free to post within the policy of this site – I don’t look for trouble as trolls do. If you don’t like it you can move. I’m tired of you self-righteous types playing the holier-than-thou card. I try not to engage the trolls unless they go beyond the pale and usually only if they are attacking me. In fact you can THANK me for reducing their numbers and keeping this site a little more civil. You want to do some real good turn your attention & reply’s to the obvious troll’s who are the real problem. With your misguided missive aimed at the wrong person here you fed them a heapin’ helpin’ full of encouragement. Thanks a lot. Ah, your back. We missed the troll under the bridge. Can you point out where I said that? Do you have shades of your life or do you pile it all into one lonely corner? Pretty disingenuous nonsense on your part. Your life must be pretty pathetic trying to make other lives sound sad. It that what gives YOUR life meaning? Like it or not, we can’t attribute the failure of every single device to that of Apple’s products. This was not a smartwatch. This was a fitness band. Most likely, its demise is as a result of the popularity of the Fitbit, not the Apple Watch. 100% agree. I love my Apple Watch but I’ve seen far more Fitbits in the wild than Apple Watches. Yes, and I’d like to say that I bought a Series 2 black SS model with bracelet at 3:08 in the morning the night it was available, and really am having fun with it. But I would never have considered a fitness band, just as most people buying smartwatches. People wanting fitness bands don’t consider smart watches either. While there’s overlap, they’re aimed at different segments of the market. It’s just that this site attributes every failure of every competitor to Apple. Don’t worry I’m sure inside a year they will launch a Surface Watch/Fitness band as if its disasterous predecessor never happened. I doubt it. The software and hardware teams are gone, as is the supporting SDK. They would need to start from scratch.